Conrad Yager negotiates the slots on the Boundary Glacier, high on Mount Athabasca. There’s an adage in mountain climbing. There are old climbers and bold climbers, but there are no old, bold climbers. I have to confess that some of my favorite climbs stopped short of the true summit, sometimes because of conditions, the weather, or illness. I certainly relish standing on the very apex of a peak, but what I relish more is the act of climbing, camaraderie, and perhaps most of all, coming home alive. On a recent trip to the Canadian Rockies, that’s exactly what I experienced. For six months, my long-time climbing partner and I planned a trip to the Bugaboo Provincial Park in British Columbia. It’s a land of winding glaciers and nunataks (granite spires that thrust skyward from the glacial ice), we’d hoped to climb the storied, quality granite. For weeks, we packed ice axes and ropes, freeze-dried shepherd’s pie, and fuzzy gloves. We arrived in Canmore, Alberta, only to find out that ever-spreading wildfires led to the closure of the park. So, we scrambled to reorient and find other places to climb. Straddling the border of Banff and Jasper National parks, just a few hours west of Calgary, rests a massive mountain, Mount Athabasca. This hulking peak reaches 11,453 feet and its glaciers pour from the adjacent Columbia Icefield. Rather than scale the summit, we identified a sharp rock ridge on its flank, known as A2. This became our first objective. Athabasca is situated in an area spared by the many wildfires that have plagued the region. With a forecast of no wind, a full moon, and azure skies, we headed out from the parking lot at 4 a.m. after driving in from our lodging at the Mount Edith Cavell hostel, a rustic bungalow that exists in the shadow of its namesake mountain. Our approach hike would need to be done in the dark so we could be on that glacier in the cold morning hours, when the tenuous snowbridges that cross seemingly-bottomless crevasses were most stable. After a three-hour hike, we arrived at the toe of the Little Athabasca Glacier. We donned crampons, spiked platforms that strap to your feet, and razor-sharp ice axes. Within a few hours we’d crossed the glacier, however doing so required intense route finding among gaping, hungry crevasses. 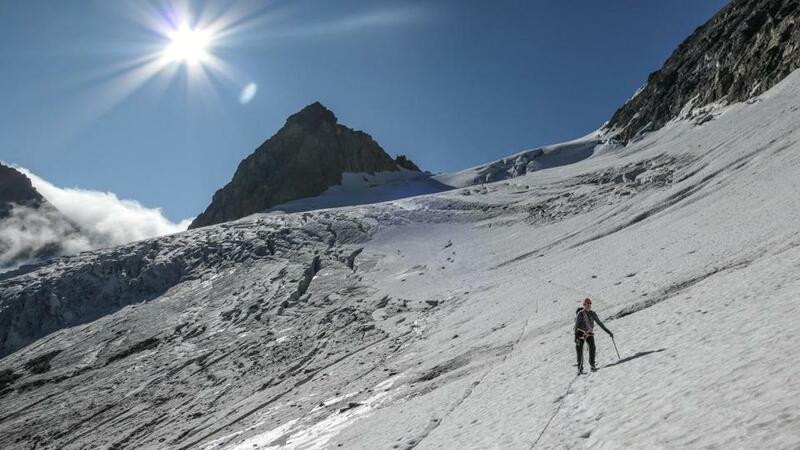 Once across the glacier we climbed a 500-foot-high slope of loose rock, referred to as scree, and descended the other side to gain a second glacier, the Boundary Glacier. This glacier was less broken up than the Little A, and we were able to ascend to the toe of the final rock ridge. As we rested and forced down energy bars, loose rock cascaded off the ridge. It became apparent that the rock was quite unstable and would require a lot of good luck to ascend to the summit without incident. Three hundred feet from the top, we retreated, leaving the peak for another day, perhaps a colder one when the rock would be frozen into stability. Given the smoky conditions in other parts of the range, we headed to Lake Louise to attempt a separate peak, Mount Niblock, 9,763 feet in elevation. This quartz and granite peak boasts an ardent, character-building approach, despite being only three miles, which departs directly from the opulent Chateau Lake Louise. Again, we headed out at 4 a.m. and hiked for a few darkened hours, the thud of our pulses throbbing in our temples. There was a certain degree of trepidation, as these valleys are home to a healthy population of grizzly bears. However, we confidently holstered a giant can of bear spray, a mace-like product that’s been shown to be a lifesaver in the event of a bear charge. We rounded Lake Louise and headed uphill into a valley with a stunning hanging lake, Lake Agnes. Like Lake Louise, Agnes beamed with an electric blue hue, a result of suspended glacial silt in the water that yields a Caribbean-like color of water. At the foot of Lake Agnes we stopped to peer into the idyllic Lake Agnes Tea House, a backcountry chalet that has served soup and sandwiches and tea to hikers and climbers since 1905. The tea house was not yet open in the early morning light, so we headed uphill toward Niblock’s giant scree cone. An hour of navigation on slippery talus later and we cast off on our first pitch (a ropelength) of technical rock climbing. The stone was loose and four pitches later we were delivered to the col between Niblock and Mount Whyte, the adjacent summit. There at the col, we assessed the rock stability and made the difficult decision to turn back, again just a few hundred feet from the summit. A series of steep rappels brought us back to the scree cone, which we swiftly descended back into the valley. As we worked our way down, a family of three stark-white mountain goats clambered down a cliffband affront Lake Agnes. Their tenacity and precise movement was fascinating to watch, as these creatures are built for navigating steep rock faces and crumbling stripes of rock. By now the sun was high and we were feeling satisfied with our decision, as well as content with the climbing we did, despite not standing on the penultimate summit. We ambled into the now-bustling tea house. Within 10 minutes, deep in the wilderness, we sipped on vegetable and lentil soup and chai tea. As we rested to prepare for the descent back to the car, we sat in awe of the mountains and buttresses, like the harrowing face of the Big Beehive, a round-topped, cylindrical heap of quartz that guards the outlet of the lake. As we finished our meal and talked about the good decisions we believe we’d made, the wind shifted. Gray smoke pushed into the valley, up and over the Big Beehive, swallowing it in the high alpine air. Seasons-Alpine rock and snow climbing in the Canadian Rockies is best June through September. By mid-fall, waterfall ice begins to form on the Icefields Parkway, making a world-class venue for ice climbing. We headed out at 4 a.m. and hiked for a few darkened hours, the thud of our pulses throbbing in our temples. Guides-Yamnuska Mountain Adventures, located in Canmore, Alberta, guides almost any type of objective. www.yamnuska.com. Maps and lodging-HI Hostels operate a variety of hostels throughout the Canadian Rockies. www.hihostels.ca. Likewise, the Alpine Club of Canada operates backcountry huts in key locations, and sells guidebooks and maps. www.alpineclubofcanada.ca. Hut lodging from $25.